DiI walked through the narrow alleys of the Hutong how the traditional quarters in Beijing are called. It was a lovely late summer morning at the end of August and I was on my way to a Cooking school which is located in one of the old quarters. When I headed there for the first time the day before I got terribly lost in this maze of courtyards and alleyways and even this time I had to think to remember the way. I had registered for a course called “Hand Pulled Noodles” and I had a vague idea what we gonna do but I didn’t know exactly what would expect me. It turned out that we would prepare “Xinjiang La Mian”, Hand Pulled Noodles, a local speciality of Xinjiang Province in Northwestern China, coincidentally a region where I would travel one and a half months later. 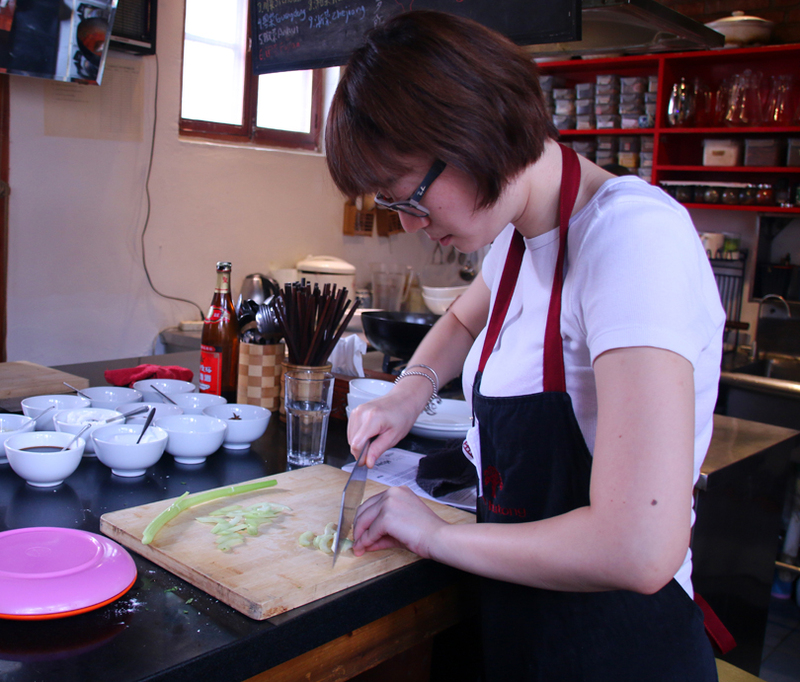 Our Cooking instructor was a young female called Miya who is originally from Jiangsu Province north of Shanghai. The other participants were Natalie, Trevor and Tommy from different parts of the US. All of them worked here as English teachers and got their jobs through the same company in Beijing but funnily they had never met before. Since teaching English in Beijing is exactly what I am planning to do, they noted down the name and telephone number of their agency and gave me valuable tips. At first we mixed flour, water and salt to a dough which we kneaded for about 20 minutes and pressed it then onto the countertop till it had a thickness of of one centimetre. Then we cut the dough into 1.5 centimetres stripes. 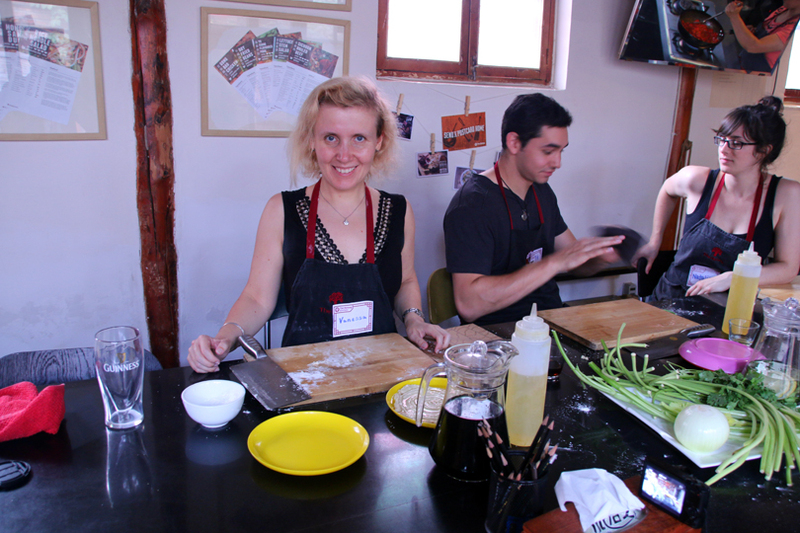 Afterwards Miya demonstrated how to roll the noodles and wind them into a spiral on a plate. 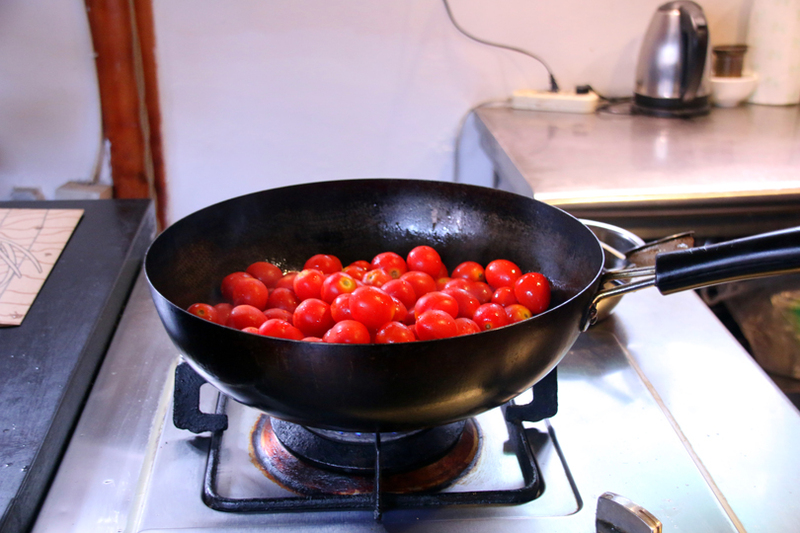 While the sliced dough rested covered with a plastic wrap for 30 minutes we prepared a spicy noodle sauce consisting of cherry tomatoes, chicken meat, onion, garlic, chillies, ginger, aniseed, sichuan pepper, cumin seeds, cardamom and cinnamon. Once the sauce was ready we started to hand pull the noodles. Therefor we rolled each section until it had a diameter of o.5 centimetres. We banged the rolls of dough onto the surface of the countertop and stretched the noodles apart. 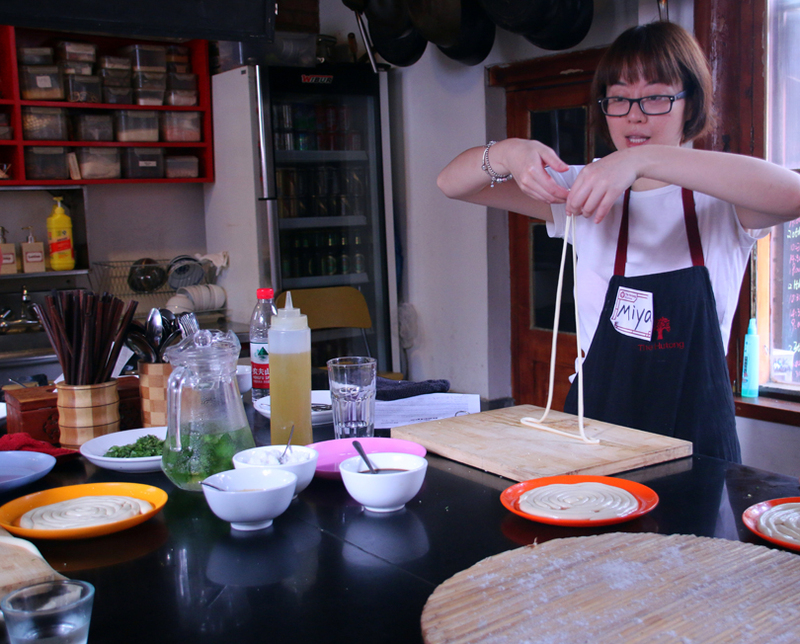 This may sound easier than it was because the dough easily broke, but after a while I managed to hand pull noodles. When the noodles had the right length and thickness they were placed in a pot of boiling water and cooked until foam rose up. 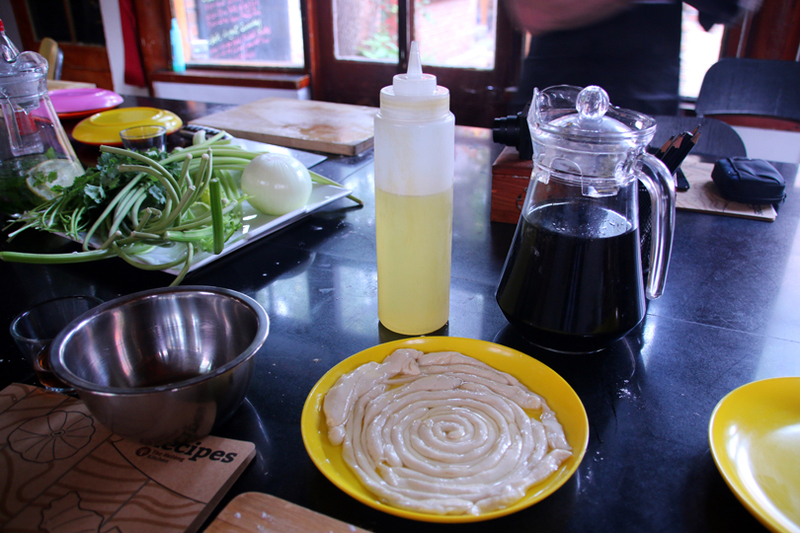 Afterwards we made “Pai Huang Gua”, a smashed Cucumber Salad, out of cucumbers, garlic, fresh and dried chillies, ginger, coriander, sichuan pepper, cumin seeds and cinnamon. When the dishes were ready we sat together and savored our food which was super-delicious and gave me a great introduction of what would expect me in Northwestern China. In the meantime I have been to Xinjiang Province and I had Hand-Pulled Noodles with various toppings there once or sometimes even twice a day. You can get them in almost every restaurant in Xinjiang Province. One Noodle dish costs between 10 and 16 RMB (1.60 to 2.60 $; 1.40 to 2.30 Euros). No restaurant there would dare to serve the noodles as a finished product. Everywhere the noodles are freshly prepared which deeply impresses me when thinking about how long it took us to make them. I also cooked noodles once. It was so much fun!!!! It definitely is. 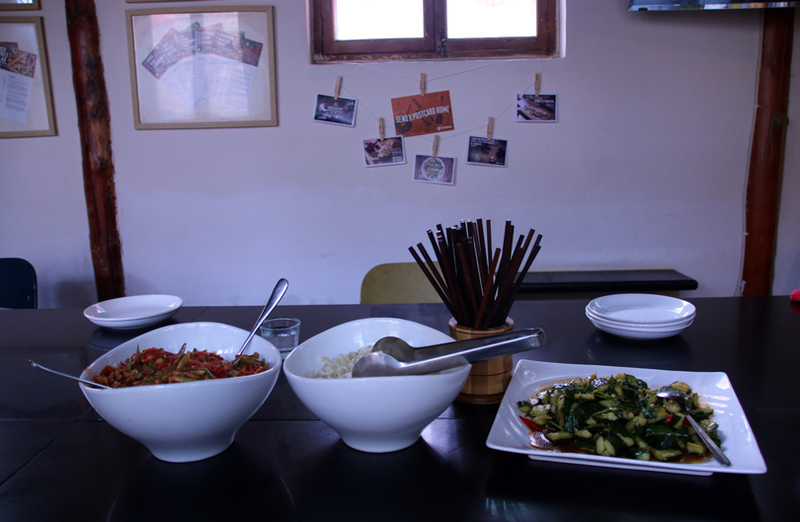 Plus it is so delicious and a great opportunity to get an insight into other cultures and their cuisines. Thank you so much for your comment, Agness. You definitely should, Sophie. 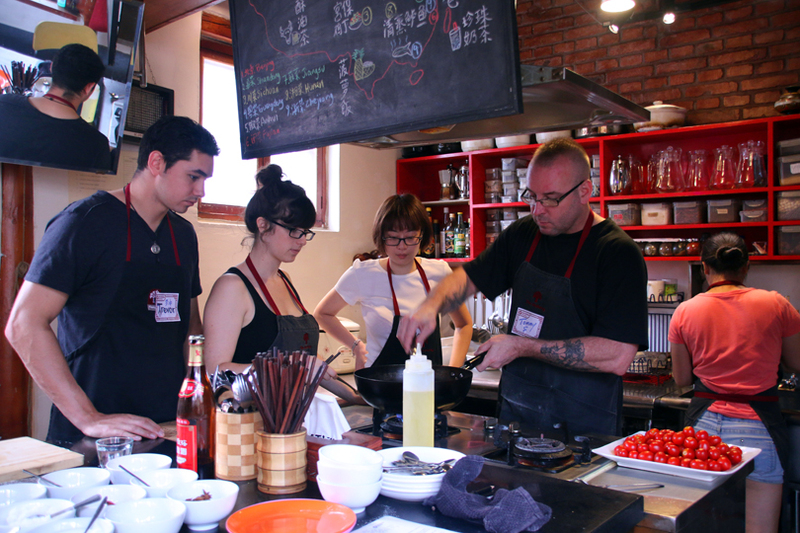 I can highly recommend to do a Cooking class in a Hutong for its atmosphere, for the course itself and because it’s a great way to experience all different types of chinese food. Thank you so much for your comment.